After returning from a two-year trip around the world, chronicled in Love and Free, Ayumu Takahashi was up for another adventure. This time it would happen right in his own back yard, the southern islands of Okinawa, Japan. Here he suddenly came up with an idea that would change his life. He would build a self sustaining island village, a place where all are welcome to stay and enjoy the beautiful tropical surroundings. But it turned out to be no easy task. Combating opposition with a lot of hard work, Ayumu and his companions must overcome all kinds of obstacles to create their little piece of paradise. 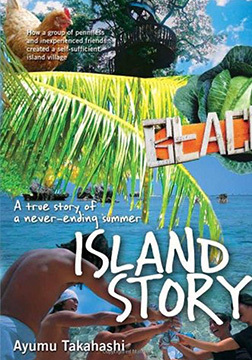 Island Story is a photographic record of his eight year long quest to create a new green living environment.